As far as I can remember, I was always in the arts. In kindergarten, I would paint large designs on newspaper print with poster paint. At ten my mother brought me my first pad & water color box. I painted from sceneries to abstract to patterns, after that. Art supplies always became my choice. In 1989 I was accepted to OVERBROOK HIGHSCHOOL. (ART MAGNET PROGRAM) There I learned how to put designs in perspective with shades & colors. When& how to use cold and warm colors. I learned different mediums, pen/ink line, pencil shading, clay, oil-painting, acrylics, and how to build a canvass from scratch. My First art show was in 1991.My instructor LES KAMISON entered my Sr. oil painting project in the all city art show at the original convention center 39th spruce. Where I won 1st prize from KAPPA ALPHA PSI MEN OF BACA. Also a Sr. class (OVERBROOK ART MAGNET ART-SHOW) was Held at St. Joseph university city ave. Phila. Pa. After graduating in June. I attended BARBER SCOTIA COLLEGE CONCORD N.C. Where I studied art as a major. In 1993 my junior year, I held several art shows at the school, as well attending several festivals in charlotte n.c. selling created original paintings. In 1995 I returned to Philadelphia. Young educated searching for a gallery to have art shows. I met Mercer Revcross C.E.O. 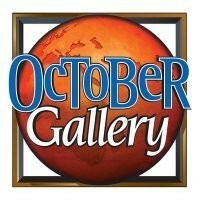 of OCTOBER GALLERY was annually having the biggest art-shows on the east coast. ART-EXPO 1996-2005 At Temple University. Broad Cecil b. Moore. I exhibited sold several pieces. Also at the expo the gallery would have art auctions hosted by Mercer himself. I sold created original oil paintings and mix media acrylics. After that exposure other galleries wanted and collaborated with me to have shows and sell my created pieces of art. (1997) SADIE WEBSTER 19TH WALNUT. (1998)- GALLERY- 911. 911 ARCH ST. PHILADELPHIA PA. (1998-2000) well fed art gallery 3rd n arch Olde city phila.pa. 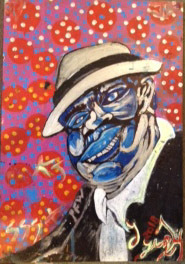 (1999-2007)/May-Aug./ every 1st of the month I attended 1st Fridays artist row in Olde city Phila pa. In 2007-2009 I toured to Venice beach California entered in the artist lottery and won several times and slots to exhibit and, sell my new works to art tourists from all over the world. I returned to Philadelphia in 2010 and set up a studio creating pieces every day and some commission projects in the music industry. In the near future there are plans to take a winter tour from PHILA.to N.Y. to Miami. Thanks in your interest in reading my history to bring me to this vision to create handsome art out of blank wood or canvasses. My MOTTO AILLIA .Art is Love=Love is Art.